Hiring managers know full well the impact of a bad hire. As a result, it’s only natural for them to want to take their time when identifying and interviewing potential employees. But by dragging out the hiring process, companies run the risk of missing out on first choice candidates. In a candidate-driven market, time is of the essence. You don’t want to lose a candidate to another company. You also don’t want to have the candidate lose interest in you. Like dating, excitement is high in the beginning when a spark first appears. But playing hard to get for too long can have a negative outcome. Of course you want to find the right person, and there’s no clear way to know how long that will take. But going into a process without an actual hire date in mind leaves too much wiggle room. If we adopt the notion that there might be something better if we just hold out a little longer, there’s no end to the process. Don’t let perfect be the enemy of great. Great candidates can turn into the perfect employee once they’ve been given the chance. You have to ask yourself if you’re willing to lose the great candidates you’ve found for a chance at finding what you think might be better. Rather than leaving your timeline open until the perfect candidate appears, set a hire by date for the role and try to stick as close to that timeframe as possible. Of course, the timeline shouldn’t be a reason to hire someone that isn’t right for the role. But timelines are important to help manage a process that could take longer than everyone would like. Keeping the interview process consistent will ensure it remains efficient. Clearly outline who should meet candidates for a particular role before the process gets started. If your process includes the candidate meeting a long list of people, try scheduling multiple interviews in one day, or even having the candidate meet more than one person at the same time. This isn’t to say that the candidate should only come to the office once. However, many candidates have full-time jobs. 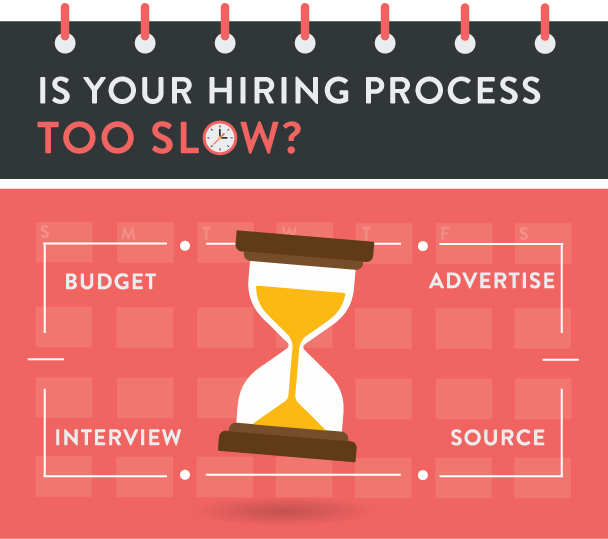 It’s important that your hiring process is respectful of the candidates’ time constraints. Excessive, long drawn out interview processes that transmits a sense of disorganization leaves a lot to be desired. It’s important to remember that the candidate experience of all the candidates you interview, not just the ones you hire, can have a lasting impact on your future hiring efforts. With so many applicants at various stages of the interview process and with multiple jobs to fill, following up with candidates can easily take a great deal of a recruiter’s time. Clear communication of your timeline, hiring process and expectations of next steps are however essential to managing the candidate experience. It’s important to put yourself in the shoes of the candidate. Not knowing if you’re moving forward in the process, if you’re no longer in the running or are just in a holding pattern until an executive comes back from vacation can cause unnecessary angst in even the most confident job seeker. Your company’s hiring process doesn’t need to serve as a stressor for your candidates. If it’s going to be a few weeks before you move forward with the next steps, let them know. The silence on your end can be interpreted as a lack of interest and actually motivate the candidate to consider other options more seriously. Why give them the opportunity to fall in love with another company before it’s time? When you and the candidate are on the same page, everyone feels better about the whole process.